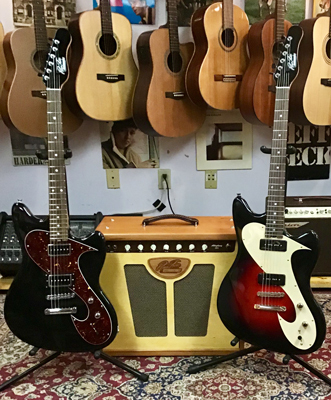 Two Tom Brantley gold foil pickups; two choices: 1) straight up 60s Tokyo, Japan style, or 2) a mash up of both 60s Tokyo Japan and 60s Dearmond ala Euclid Ohio. Our fave! This one is like an old Ford: "you can order it in any color you want, as long as it's black!"